Sometimes a picture is worth a thousand words. Here two need no words. Ooh, scary terrorist. Coming out of the baggage check. 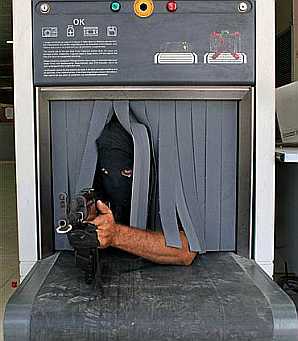 The perfect poster for the US’ TSA. (3 oz. liquid in a 4 oz. bottle? Toss it, men!). The Jerusalem post put these two photos together. 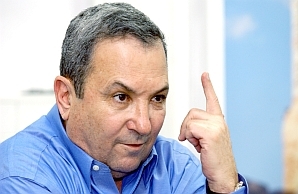 Ehud Barak, easily our least effective prime minister until Ehud Olmert, has a shot at running the amy as defense minister after botching up his job as Chief of Staff. I’m sure he wasn’t sitting low in baggage claim with the picture was snapped, but if you just put a little ‘thought bubble’ around the cute terrorist, you’ll get the idea. Life will get interesting in Hamastan and Fatahland. Each will consolidate their turf. Fatah has to make a stand in the West Bank, or it will fall to radical organizations like Hamas. Hamas, unlike Fatah, has figured out how to rally their people beyond the clan level. That’s dangerous, because the fundamental way of life for Fatah is the clan (and pitting clan against clan to achieve a higher goal). This internecine squabbling is what helped Arafat look so incompetent at times; he could bring his boys to a battle, but couldn’t steer the peace because, effectively, the best he could do is try and co-opt the direction of the current most powerful clan at that time, for that issue. The losers, predictably, will continue to be civilians. Sderot, Kiriat Shmona, (G)Aza and the “Palestinian street.” While attacking Gaza will now be easier (if the person has a weapon, kill them), the West Bank, which helped bring Hamas to power and therefore has a strong constituency, will be energized to repeat their victorious operations in Gaza. This means more bullets flying in marketplaces, more gunmen using human shields, and more tragedy and horror to mar the next generation of a people with little hope. When the international community is ready and willing to take action again a terrorist force that they themselves have designated, and engage in a multinational action against a true evil threat to all democracies, then Israel might have a chance to come to the table, with its international allies, as part of a real solution to Gaza and the West Bank. Until then Israel will be the great distractor used by Wahabist controllers in one of Israel’s neighbors, and Shi’ite fanatics ruling another.